After five intense weeks of trekking and travel, we decided it was high time that we reward ourselves with a little downtime to kick back and relax before heading home to Chicago. The only problem is that India is such a huge, diverse country, we were spoiled for choice of interesting places to go. Way back when we first visited the country in 2001, we toured most of the A-list sites like Agra’s Taj Mahal and the temple towns of Rajasthan. So this time, we thought it would be fun to venture a little further afield and visit the southern Indian state of Karnataka, where we just so happened to have two different sets of friends to visit. After bidding farewell to Ladakh, we caught an early morning flight from Leh to Dehli and then on to Bangalore, the sprawling capital city of Karnataka. Here we stayed on the outskirts of the city with old family friends, Prithvi and Yeshi, and their two delightful daughters. 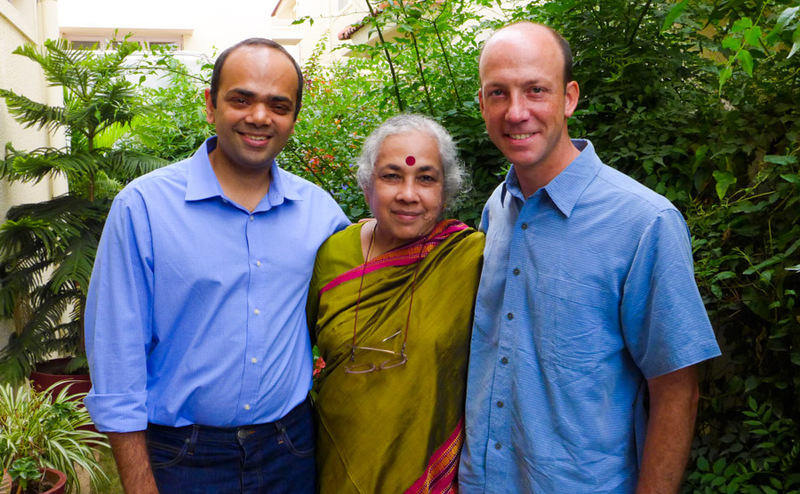 Prithvi’s mother, Prim, was visiting from Chennai while we were in town–an added bonus! Chilling out in their suburban home felt strangely American and gave us a great chance to catch up, regroup and take care of normal travel business, like, you know, getting a root canal! Turns out, Yeshi’s family dentist lives just down the street from her, practiced dentistry in California for several years and had a very clean, modern practice not too far away from their house. We took advantage of the down time to take care of my tooth, so that our plans to hike the Wonderland Trail in Washington state wouldn’t get derailed when we arrived back home. Yeshi arranged an appointment for me on the afternoon of our arrival, and, shortly after touching down, I was under the drill in the dentist’s chair. Fun! I had a follow-up appointment two days later right before catching an overnight train to Hampi. 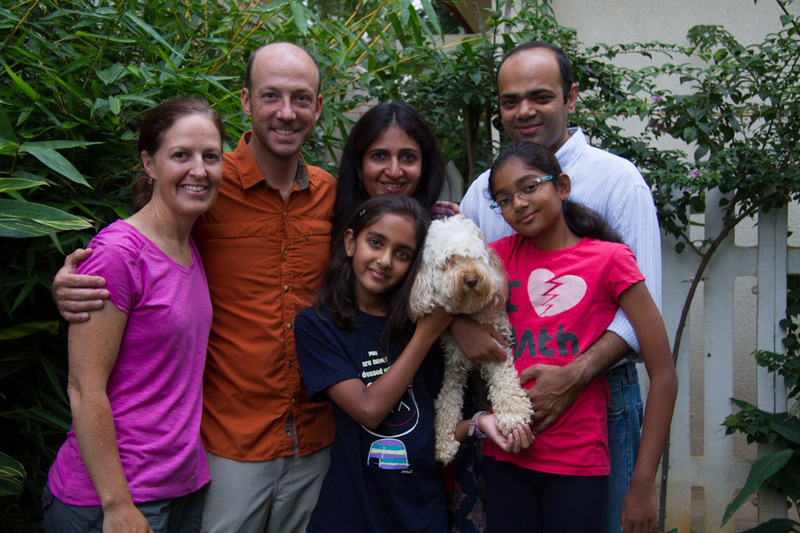 Given all that, we didn’t get out to do much in Bangalore, but sometimes taking a break from your vacation is just what the, uh, dentist ordered. In Hampi, we met up with Tony, an American colleague of Matt’s, who teaches in the religion department of his high school. Tony often spends his summers doing research in this quirky little tourist town, which is a UnescoWorld Heritage Site that attracts Indian visitors and foreign backpackers alike who come to see impressive temples set amongst sprawling fields of rounded boulders. Walking around all those impressive temples and bizarre rock formations made us feel like we had ended up in an episode of the Indian version of The Flintstones. Totally surreal! With only two days to see the sights, we opted to rent motorbikes and casually cruise the quiet country lanes around Hampi. 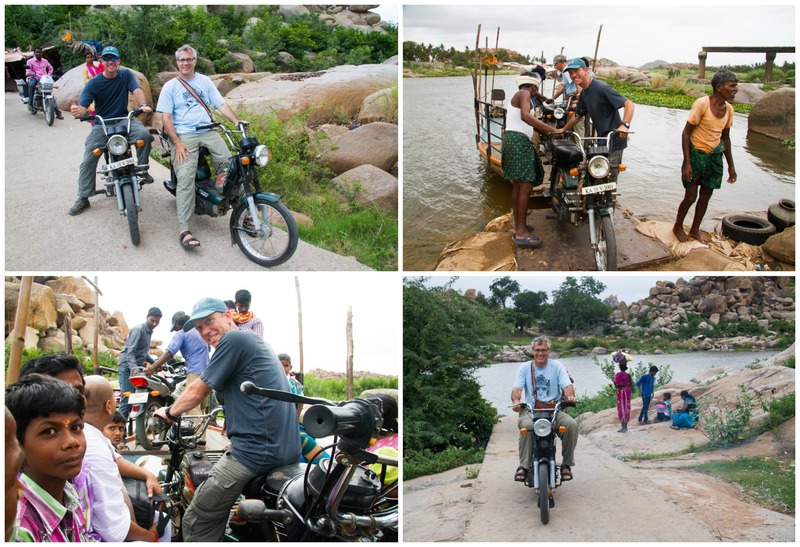 It was definitely an interesting way to move about, particularly when we had to take the bikes on a small ferry to cross the Tungabhadra River—a new experience, to say the least! When we had our fill of the temples, we enjoyed the vibe of the small backpacker-friendly town, chilling out in the traveler cafes, taking a rooftop yoga class and even enjoying a cheap and relaxing massage. Hampi’s proximity to the river makes this tropical town an ideal bird habitat, and we kept our eyes peeled for kingfishers and bee-eaters that can be spotted on a short walk outside of town. Colorful lizards are also common here and make for attractive and slower-moving subjects. And since this is India, it almost goes without saying that there were monkeys. From Hampi, it was off to the university town of Mysore. We took another overnight train to maximize time and met up with Tony again to tour some of the attractive town’s impressive sights like the opulent Maharaja’s Palace, the Mysore Zoo, the Karanji Nature Park and more temples. We also enjoyed sampling the culinary delights of south Indian cuisine, especially the thalis. 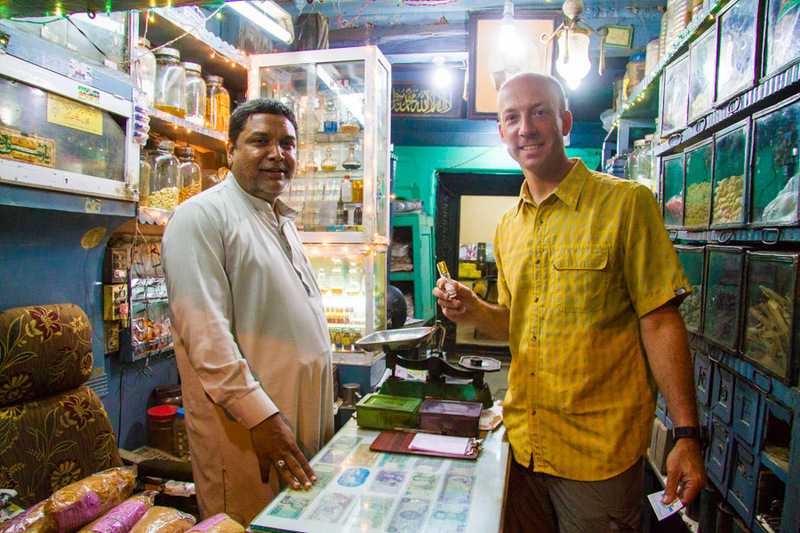 Somewhere along the way, Matt developed a pretty intense head cold, so we stopped at a potion peddler’s shop where the proprietor whipped up an ayurvedic elixir that he guaranteed would cure it. The jury’s still out on that one, but the little shop was fascinating to poke around. By far, our favorite photographic experience of the trip was wandering around the Devaraja Market early one morning, just as the fruit, vegetable, flower and kumkum (colored powder) vendors set up their stalls for the day. What fun it was for us to try to capture the attractive produce and colorful sights in this lively place. 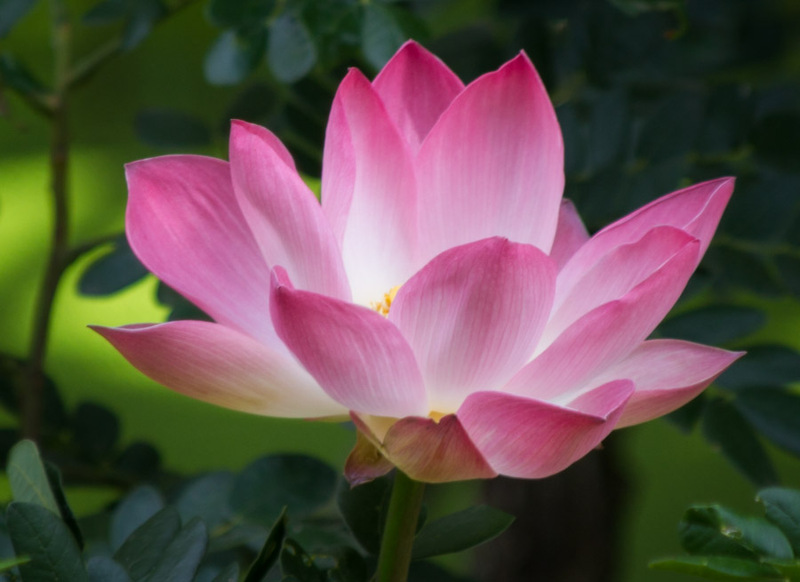 All in all, we had a great time in off-the-beaten path Karnataka and would love to spend more time visiting this fascinating state in southern India. How about you? Have you ever heard of Karnataka? Is it a place you might like to visit on a trip to India? Thanks, Michael. We really enjoyed speaking with you and Michelle last night after the presentation. We have met Alan on a few occasions at Riverwoods. Hope you two make it to Iceland in the future! Yet another interesting place to visit. Thanks for sharing! You are most welcome, Andy. You are a big traveler. When are you going to make the long haul to India? Charming post.I had been to Hampi and nearby Belur and Halibeedu.The stone carvings and the rock formations are breathtaking.These are places where time stands still. Hampi was a delightful surprise to us. We often think of all the hustle and bustle of India, but Hampi was so chilled out and mellow. It definitely feels like time stands still there. We only had a few days in Hampi, so we’ll have to check out Belur and Halibeedu next time. Thanks for stopping by! Yes,Hampi is not a regular tourist destination and that is why it has retained its charm.Your medical escapades reminded me of my getting a fracture of the arm fixed in Vienna. Ouch! Dealing with medical issues while abroad is never fun. Hope your arm is OK now. Medical issues and that crazy little ferry for the motorbike – you guys do know how to keep holidays interesting. We definitely could have done without the finger surgery and the root canal, but it’s all those wacky things you encounter in foreign countries (and would never find at home) that make international travel so fun and interesting. Do you have any crazy transport we could try up there in Saskatchewan? Nothing comes to mind. It all seems pretty normal to me but then I live here.